Mental health is woefully silent in business conversations. Entrepreneurship is cool. Mental health challenges are not. According to the National Alliance On Mental Illness 1 in 5 American adults will experience mental illness in any given year. The numbers, both raw and percentages, are staggering when you stop to carefully consider them. Suicide is the 10th leading cause of death in America. It’s the dark, often not talked about, downside ending for too many businesspeople, including business owners or entrepreneurs. Right now, if you’re feeling that you may be battling that feels too large for you to handle – emotionally or mentally – do yourself, your family, your friends and your business a big, big favor. Reach out to a mental health professional. Make an appointment to see a doctor and keep the appointment. YOU are the horsepower and operating system behind your career and your business. You’ll regularly run software programs to keep your computer working properly. Don’t ignore the work to keep your mind working properly. The baddest computers on the planet need help getting rid of extraneous files and other things that clog up the works. Your brain is no different. It doesn’t mean the computer isn’t state-of-the-art. It means we have to make a wise, smart investment to keep things operating at a top notch level. Make the call right now! These facts are important because too frequently we’re bombarded with advice and admonition that may be beyond our capabilities. Worse yet, some advice may be dangerous because it assumes we don’t have any serious issues threatening our mental health. I admit that the headline for today’s show could be considered such advice — but it’s not. It’s not intended to pressure you into thinking that anything is easy. Truth is, changing your mind is very difficult. Especially changing your mind to reach out and get the help you suspect you may need. Or changing your mind to at long last find some willingness to talk with somebody about things that may be big hurdles for you. Anxiety. Fear. Depression. So many things can get in our way and it’s perfectly understandable that we sometimes need help. You’ll quickly engage a professional expert to help you with a variety of business challenges. An accounting firm gets a call when we need to have outside folks dig deeper into our numbers to make sure there’s high integrity in our company, and to ensure that our processes are rock solid. An HR firm gets a call whenever we need help with our recruiting or our dotting i’s and crossing t’s with the legal personnel issues in our firm. An attorney gets a call when we’ve got a big contract to execute. We want protection, for ourselves and our company. So we lean on people with an expertise beyond our own capabilities. I’m urging you to do the same thing when it comes to your own mental health. Exercise the same wisdom with your life that you do with your business. That’s a big change your mind, change your life action. Great business operators understand the value of facing realities. Ignoring problems is never a wise course. Facing them, no matter how bad they may seem, is always better. It’s the only way we’re able to effectively confront and address what ails us. Hopefully, with the best possible solution. Mental health applies to all of us. 100% of us. We all need to take good care of ourselves. It’s foolish to think we’ll be able to operate our business in the most effective and efficient ways while we’re only operating at a fraction of our best. Success doesn’t hinge on us being perfect, but it may hinge on us being healthy. Both physically and mentally. You’ve achieved whatever success you currently experience because at critical points in your life you made up your mind about something. You decided something and took proper action. You kept taking proper actions to move your idea, your business, forward. Sure, you battled all kinds of problems, hurdles, obstacles and challenges. You endured whatever you couldn’t overcome. Tenacity helped you get to where you are. And that tenacity started in your mind. I grew up during the Johnny Carson era of The Tonight Show. Actors of a bygone era would often sit across from Johnny and talk of their early days, living in an apartment in New York City where they shared space with buddies. Stars like Kirk Douglas and others would often tell Johnny about other famous actors who rose to stardom from humble beginnings in a small flat in NYC. Comedians would often talk of the other famous funny men in their lives who battled together to make their way in the world of stand-up comedy. I was always fascinated at how small groups of people would congregate, collaborate and connect. Music was my thing. During the days of my youth – the mid 1970’s – I would often read of how musicians would spend time around each others. Jackson Browne, Glen Frey, Don Henley, Joni Mitchell, Linda Ronstadt and others lived and created music in a particular area of southern California. Meanwhile, up in Haight-Ashbury in San Fransisco there was another group of people doing the same thing, but producing very different music. On TV’s Intervention we can regularly see addiction fueled by friends willing to drink and do drugs together. Some congregate to fuel creativity while others congregate to fuel destructive behavior. From one extreme to the other we regularly see the impact people have on our lives. The people in our life have an enormous impact on us. They can lift us up and help us reach success that would have otherwise eluded us. Or they can drag us down and propel us toward the ground faster. It’s why every wise parent of teens urges their children to pick their friends carefully. We know the influence friends have on our kids. Sometimes, we forget the impact they have on us as adult business people. 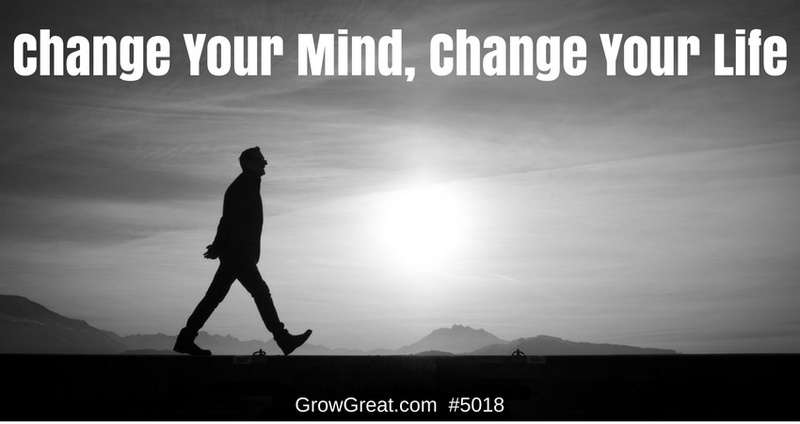 That’s where changing your mind can completely change your life. There may be no deeper loneliness than the loneliness when you’re surrounded by lots of people. Being alone in a crowded room is a real thing. You likely have a long, long list of people in your contact list. Some are closer than others. Others aren’t close at all. But you’ve got some sort of connection with each of them. Suppliers. Vendors. Service providers. Professionals. Other business owners. Company leaders. Front line people. C-Level people. All kinds of people. The list is extensive. It’s broad and deep. But you may be very alone. Wishing you had somebody who would just listen to you. Somebody willing to understand what you’re going through. Somebody who may be able to offer you their experience so you could better figure out what you should do. But you’re not that open. With anybody. You figure it’s your problem and you’re unwilling to share it with anybody. That’s a vulnerability you don’t enjoy. Your dad told you, “Never let ’em see you sweat.” So you don’t. The loneliness can be devastating though. You push through. Anxiety. Loneliness. Fear. Dread. Depression. Panic. Sadness. You figure they just go with the job. Of being a business owner. An entrepreneur. There’s a reason why successful people can readily tell stories of others who came up with them and how those relationship continue as they work to stay on top of the mountain. There’s also a reason why the alcoholic or drug addict who never gets better continues to surround himself with people who embrace the same destructive behavior. People make the difference. Particularly, the people we intentionally put around us. Courage is the willingness to share your problems. Courage is the willingness to be vulnerable. Courage is the tenacity to grow, improve and transform. It can be scary to change your mind. But it’s far scarier to refuse. And to stay the course as you struggle with the things that can destroy you, your family and your business. So today, as we’re on the verge of entering the 4th quarter of 2017 I’m encouraging you to change your mind about how you go through life dealing with your issues – whether they’re challenges or opportunities. I’m pleading with you to consider reaching out to people who can serve you – people who can be there for you, and people who will let you be there for them, too. Improve your mental health. Improve your life. Improve your business. Protect all these things that really matter to you. Invest in them and don’t ignore your need to make up your mind so you can continue to grow your life. P.S. Visit The Peer Advantage – a mastermind group of just 7 business owners from around America who meet regularly to help each other grow as leaders and as business owners.